MCT Throwback Thursday "Do Over"
It's Throwback Thursday "Do Over" with My Creative Time! Today we were asked to pick a card that maybe wasn't our favorite anymore and redo it. You can see my original below. 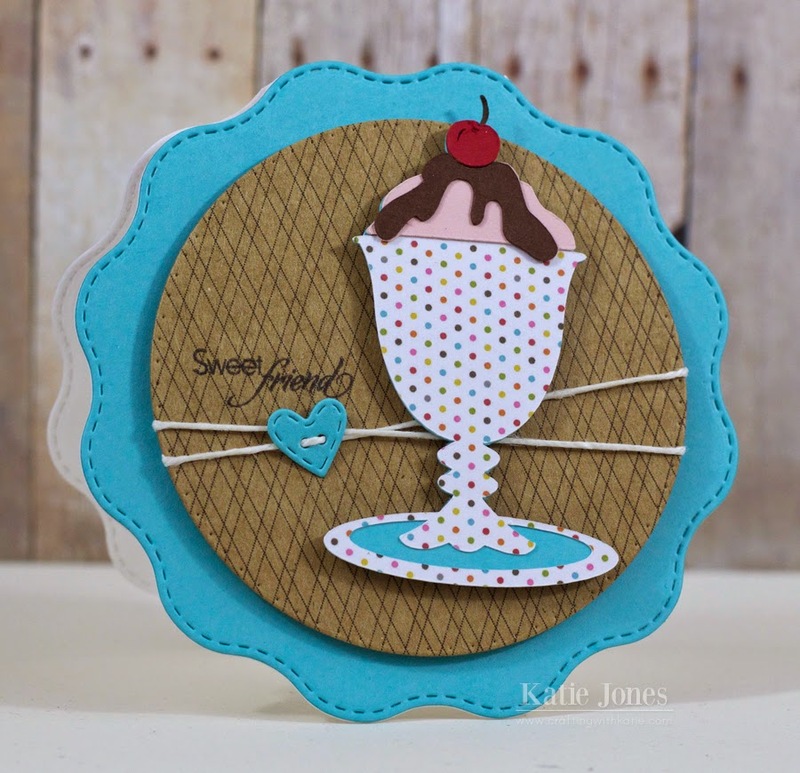 Both cards use the ice-cream sundae cut from the Cricut Kate's ABCs cartridge. I decided that the original had too much blank space, so I changed up the whole shape of the card, using the Bunch of Fun Circles Dies to make a shaped card! I used some hemp with a button, but this time the button was made with one of the Stitched Button Dies. 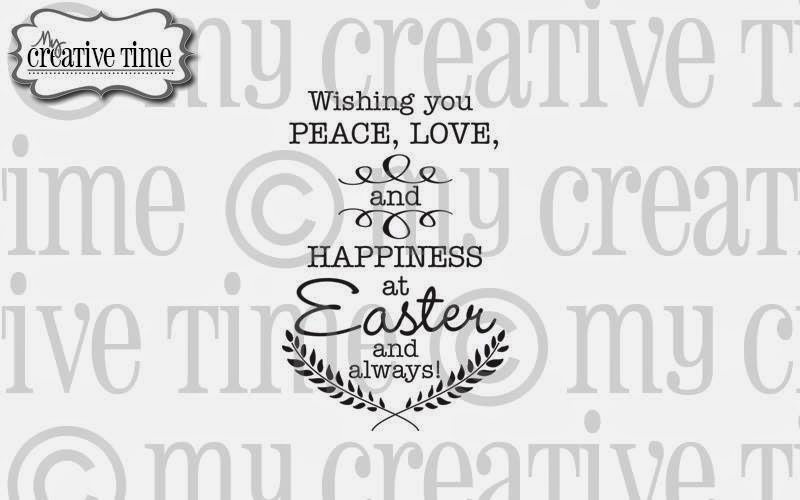 I chose a slightly different MCT sentiment this time, from Teeny Tag Greetings, and stamped it directly on the card. 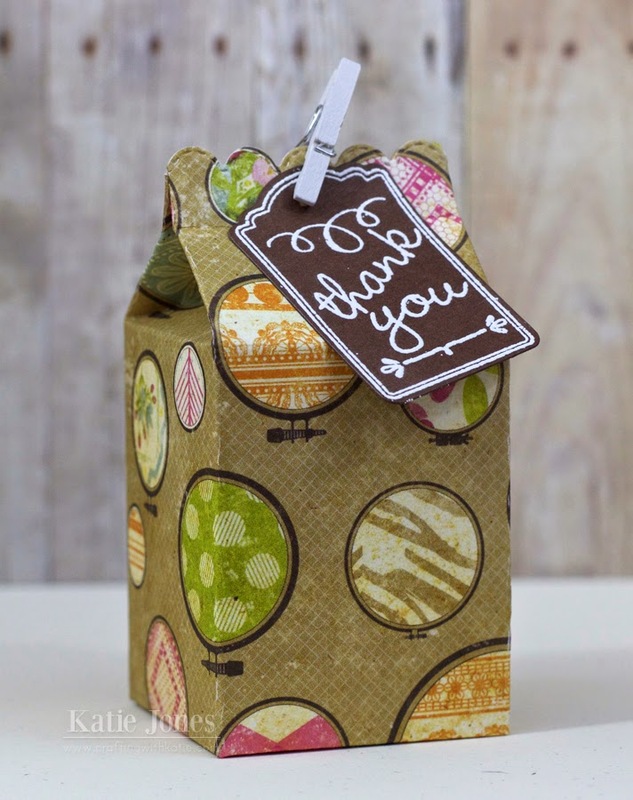 Be sure to stop by Emma's blog to see more "do over" projects! Happy Monday! 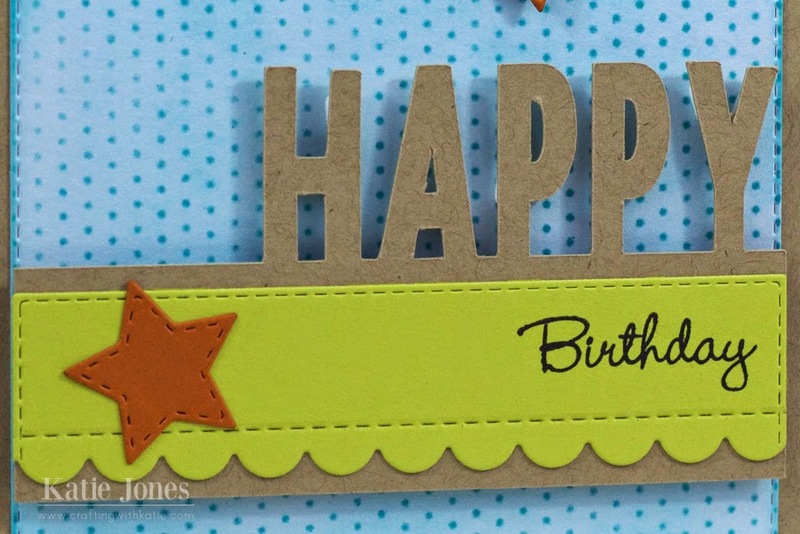 I thought I'd share a little birthday card I made for my brother over the weekend with the help of my Cricut Explore and some My Creative Time goodies. I started with an A2 kraft card base and then cut the largest of the MCT Stitched Rectangular Frame Dies out of white cardstock. I used Tim Holtz Distress Ink in Peacock Feathers to ink up the background and to add the dots with the Simon Says Stamp Tiny Dots Stencil. 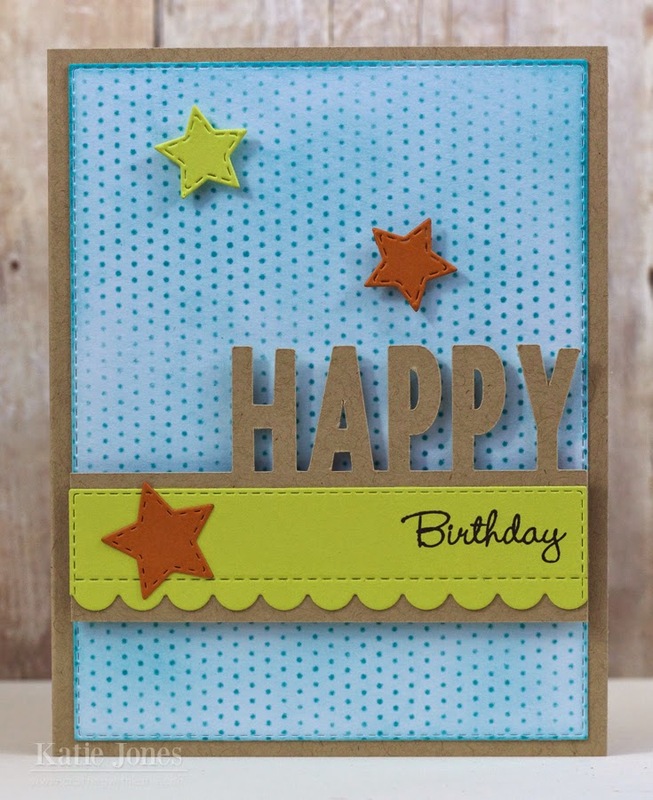 The little stars I popped up on the background were made with MCT's All Around Holidays dies. Here's where my Cricut Explore came in. I spelled out "HAPPY" using a font from the Boys Will Be Boys cartridge and welded it to a rectangle. After cutting it out, I added a lime green element that I made by using the Stitched Rectangular Die again, but this time trimming it with one of the MCT Fun Stitched Edges dies. I also stamped the birthday sentiment from MCT's Gift Card Sentiments. That larger star is from MCT's 3 Star Stitched Dies. Once of all this was adhered together, I adhered it to the card with some dimensional adhesive! 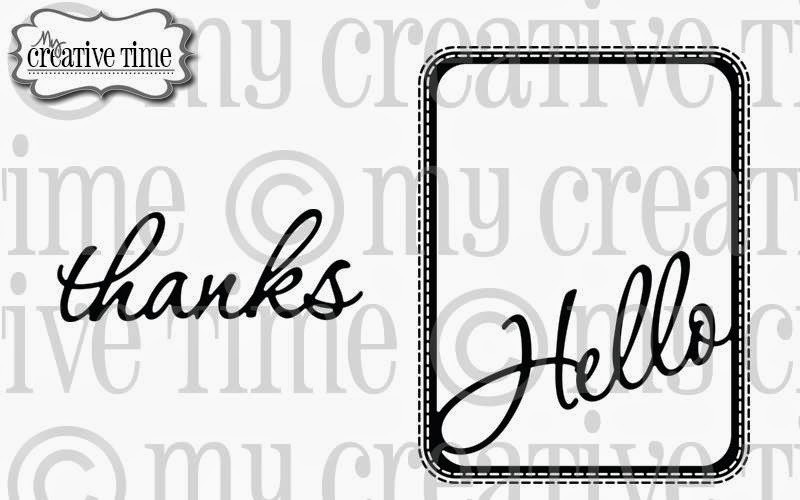 Welcome to the My Creative Time 40th Edition Anniversary Release Blog Hop! You should have arrived here from the very talented Jessica. If you just happened upon here, you might want to head over to Emma's blog, to the beginning of the hop. This is a very fun release, and I hope you are as excited about it as we are! 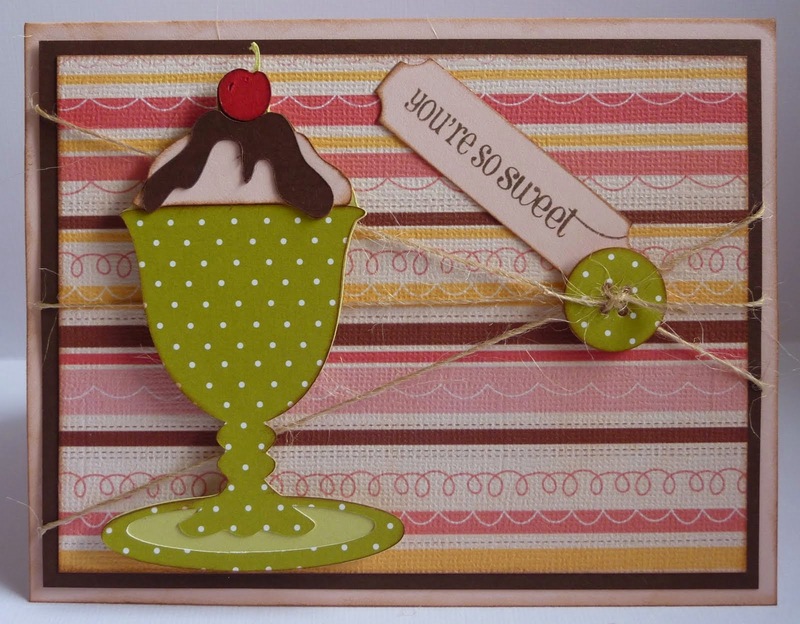 For my project today I used the gorgeous new Hello Frame Dies! 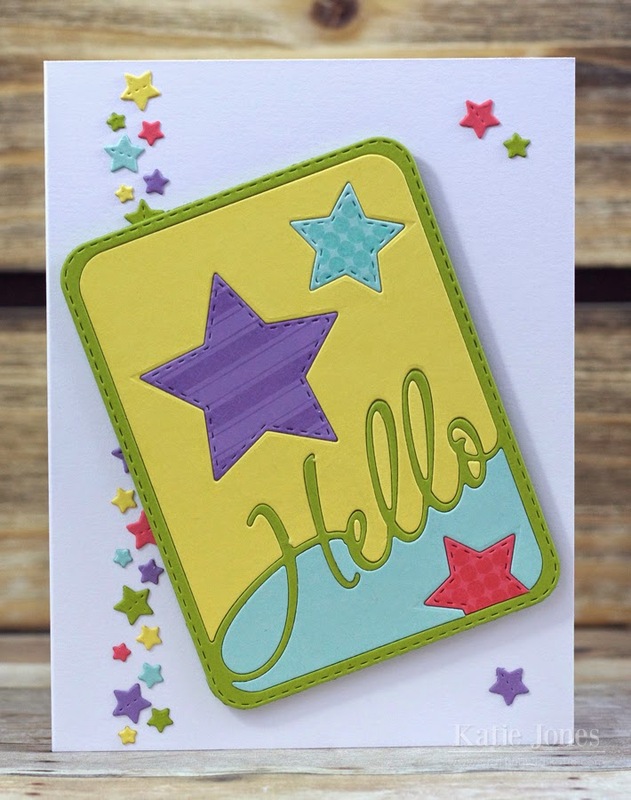 I started by just taking a white A2 card base and adding lots of colorful little stars that I made with dies from the 4x4 Journal Die + More. Then I used the Stitched Journal Die to make a base for my colorful frame here. 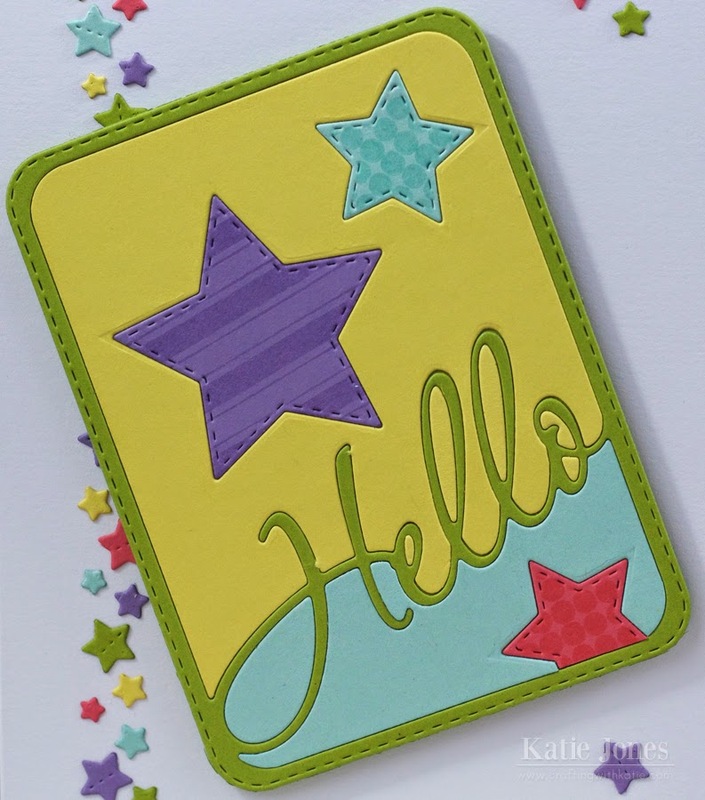 I cut the Hello Frame Die in three colors: green, yellow, and aqua. Then I used the 3 Star Stitched Dies to cut stars out of the aqua and yellow pieces. I cut more stars out of purple, aqua, and pink cardstock and stamped them with the coordinating stamps from the You Are Fabulous stamp set. Then I was ready to cover the entire base that I'd made with the Stitched Journal Die with adhesive so that I could put together all of the little pieces, starting with the green frame, and ending with the stars. Here's a closer look at the Hello Frame Dies. It is available for purchase now in the My Creative Time Store! For our "Freebie" stamp for this release, we are giving away this ADORABLE stamp, "Wishing You" to the FIRST 150 shoppers! Yep, you heard that right, this stamp will go to the FIRST 150 shoppers for FREE! You do NOT have to add it to your cart; Emma and her shipping crew will automatically include it in your package, but ONLY to the first 150 shoppers! IF you happen to come through AFTER the 150th shopper, no worries because this will be available for sale! Emma knows there will be questions on whether YOU made the first 150. After the first 150 shoppers come through, then you will see this set available for purchase along with the new release items! Also, DON'T FORGET our sale that is starting RIGHT NOW! Use the code FEB2015 to receive a discount off your entire purchase! This sale applies to "IN-STOCK" items ONLY. This sale will end on Friday, March 1st, at midnight PST. It's our last day of February My Creative Time Sneak Peeks, and I'm so excited to share our adorable new little treat box die: the Milk Carton Die! I just love this cutie-patootie! To give you an idea of the size, I filled this one up with some Dove chocolates, and 9 of them fit in there easily. 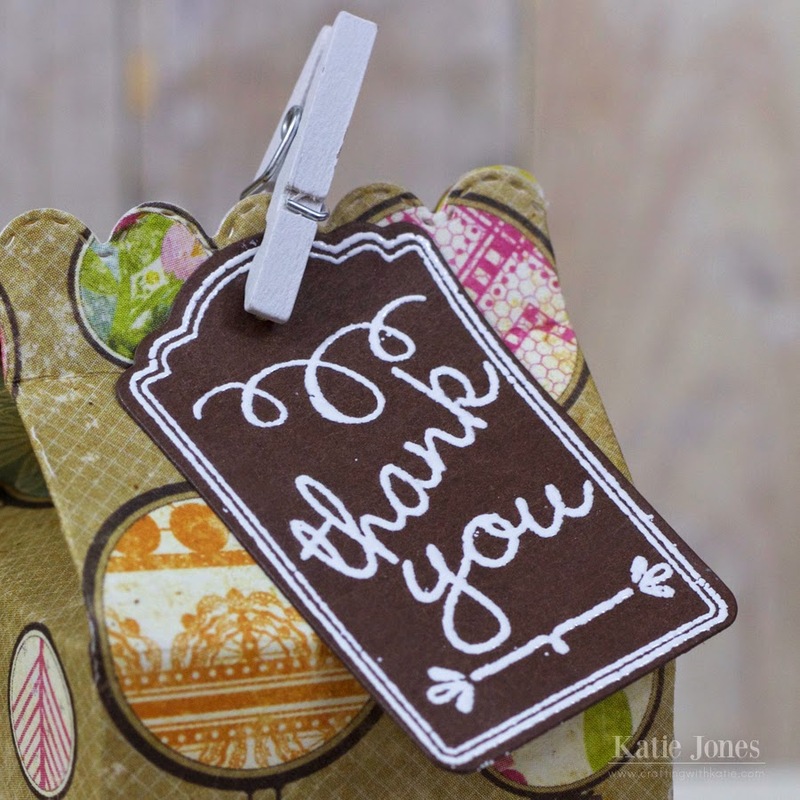 Now we are also sneaking a new stamp and die set today called Mini Chalkboard Tags. This set comes with the adorable die that I used to make my tag here, plus a little banner die, and then the outline stamp I used, along with lots of stamps to put on the inside, like the one I used here! I just love both of these new products today! A good friend of mine picked up a prescription for me and brought over a lot of food when I was sick, and I wanted to make her a little thank you. With the new Milk Carton Die and the Mini Chalkboard Tags, I was able to put this together so quickly for her. Simple, but cute!